In Ep. 036, Tim talks with Dan Gallagher. Dan recently finished a 30-year career in financial planning, having attained top industry credentials (bio & more at AuthorDan.com), beginning his retirement with his forthcoming book The Secrets of Successful Financial Planning (SSFP). Dan discusses the 6 key components to a financial plan, and sheds light on some actual secrets and poorly-knowns of the financial planning world that consumers and professionals both need to understand. A fifth of the book is comprised of thirty emotion-packed stories of client tragedy and triumph (money decisions affect personal relationships). SSFP reaches bookshelves September 25, 2018. Be sure to pick up a copy, and enjoy the episode! Tim Mullooly: Welcome back to Living With Money. This is Tim Mullooly. On today’s episode, I’m joined by Dan Gallagher. 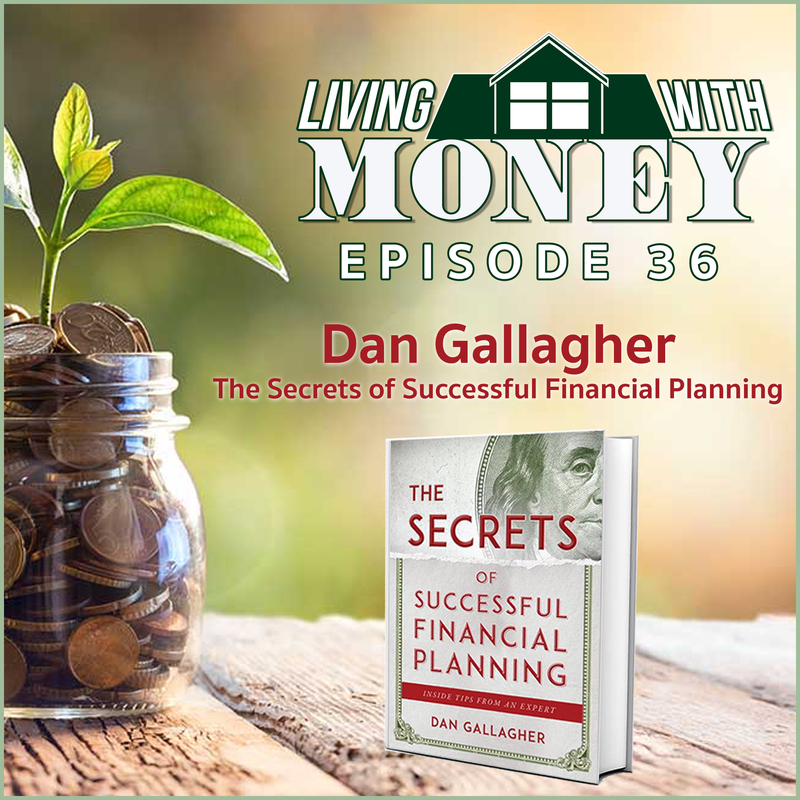 Dan is the author of the upcoming book The Secrets of Successful Financial Planning. The book comes out September 25th, so be sure to pick up a copy when it comes out. Dan, thanks for coming on the podcast. Dan Gallagher: Tim, you’re very kind to have me. Tim Mullooly: For the listeners out there, can you provide just a brief background about yourself, how you got to where you are today in your career? Dan Gallagher: My 30 year career in financial planning ended last December when I decided to retire at the 30 year mark and decided to, as much as I certainly cared about my clients, transfer them to compatible advisors and what have you, and move forward with writing that I actually started back in 1992. But it was intermittent. This current book, because I’m not that well known an author, and I sure do appreciate this visibility. But mostly, I wrote this. This is my fourth book, although two were not all mine. One was a licensing coauthored book. And another that came out last June, it’s an anthology, Planetary Anthology Earth, so it’s fiction. I have one of the 18 stories in it. But it turned out to get the most positive reviews. And another publisher acquired the rights to that story from the publisher and from me, come out with some more stories. Dan Gallagher: Yeah. It was a really fun thing to learn about. The bigger project, of course, is The Secrets of Successful Financial Planning, which comes out in a matter of days. And I wanted to write that without any bias whatsoever, so I had intended to ease into writing and teaching, what have you, hopefully speaking, haven’t done that yet though, in financial planning, but also in the fiction. Sort of living the dream now, I guess. But I don’t know whether this book will take on. It is from a fairly large publisher, Skyhawk, Skyhorse in New York. But I wanted to write a book that dealt with some things that frankly were either poor knowns, or were actual information items that at least for a time are actually kept from the public, hence the term Secrets of Financial Successful Planning, rather than how to do financial planning. And I teach people in the book how to do it themselves. But I caution them that they really do need professionals, at least for many of the topics. They should integrate these in financial planning. What are money managers for? When to engage one, that sort of thing. And also, if you’re going to do it yourself, here are the cautions. Here are the tools to go and get, which maybe be quite expensive if you’re going to do it right. It was really just to help people make the right decisions, ask the right questions of their professionals if they hire those. Tim Mullooly: Like you’re saying, the secrets may be not well known topics of financial planning. You ultimately wanted to shed light on those secrets that you have picked up on over the span of your 30 year career and share that with the individuals who might not know about the secrets. Dan Gallagher: Exactly. And some of the poorly knowns work out to be secrets. For example, for many, many years, decades, when they’re trying to determine how much income is needed, and from that, how to invest, what kind of asset base you need in order to put it all together and not run out of money halfway through retirement. There are these rules of thumb, a withdrawal rate of 3% or 4%, may be conservative, et cetera. And if you’re withdrawing that, and you’re averaging a return of somewhat more than that, that somehow that average rate of return is not going to be a problem because you’re taking a conservative draw. You’re hopefully going to average something very nice for yourself that’s above that. And if that happens, then you’re good. And the fact of the math is you’re not good. And the reason I think you know is that the order of returns, or lack thereof, of losses, is critically important. You can have an average rate of return that is, say, 7%. It can be composed of loss years and so on. But let’s say that those loss years are all towards the end. So you haven’t built up a large nest egg, even though you’ve taken say 3% or 4% per year of it, and you did average 7%. And the loss years hits you in the end. And therefore, you’re not going to run out of money. You’ll have some disappointing return years and losses in your 90s, but at least you haven’t run out of money. If you have those losses in relatively early years, they have a huge impact, not on your average rate of return, but rather on the amount that remains after the losses. Tim Mullooly: Yeah. And that sequence of returns is, like you’re saying, it’s such a big deal that not everyone thinks about from an individual standpoint. You just assume that it’s a straight line, a nice smooth set of returns for the average. These returns that you’re talking about, like you’re saying, are lumpy. Dan Gallagher: The solution to that sort of planning that is flawed, that we just described, is to have a considerably more complex model that incorporates what’s called Monte Carlo Analysis. It’s a gambling concept, but it really looks at probabilities of particular portfolios. In most cases, you would simulate 1000 different iterations, 1000 different portfolio variations. The computer will look at, let’s say, one particular asset allocation. You can in some models define changes in that over time to get more conservative automatically in the model. The Monte Carlo Analysis, drawing from a randomized simulations of how that’ll work replicate economic downturns and booms and everything in between. And of course, coming from that is a draw that you’ve preset when the client defined the lifestyle they want. And what you come out with is a certain number of times out of that 1000 that the person will end up to be, let’s say 100 years of age, or 95. I wouldn’t go much below that. It’s not prudent. Let’s say that’s 700 successes where there is money left out of 1000 by the time the person’s 100. That’s a 70% rate of success. There may be some clients who’d be happy with that. I’d be pretty nervous personally. But you go through a number of iterations to find out what is a recommended strategy that will get you well up into the 90s probability that you’re not going to run out of money halfway through retirement. Tim Mullooly: Nothing’s guaranteed. You can’t get to 100%, but you can get pretty close, so with those Monte Carlo Analysis, it’s important to get to a number that the client is comfortable with. It’s all about tweaking the different parts of their financial plan to make sure that they have something that they’re comfortable with. In the book, you kind of break down different components of a financial plan into six different parts. Can you talk briefly about what those six different components are and how they all factor into a person’s financial plan? Dan Gallagher: You have six different components, but they all do need to integrate. Cash management is the first thing. After that, you’ve got risk management. Cash management is more complex than you might think. We look at what’s often referred to as tiers for cash reserves, for example. If you’re fortunate or determined enough to put together a three tiered cash reserve, that’s really the base of your financial planning. Next comes risk management. But that base allows you to have short-term cash in case, let’s say you get disabled or out of work for a very brief time, but policy, let’s say, will not pay you much or anything for that brief period. You’ve got to be able to cover your bills. And then of course, an intermediate term cash tier, which can be invested slightly more aggressively in the next year to five, such as replacing a car. And that also implies a kind of investment you’ll have. They’ll be conservative, but they can perhaps have a tiny loss, such as aggressive money market funds. People don’t know that there are money market funds that pay a superior return. But they actually can have a loss. There’s a story about one of those in my book, kind of emotional actually because it had a substantial loss back in 2008. The next topic, of course, is risk management. Now people say, “Oh, I don’t need insurance.” And it’s true that insurance is a bet against the bad, which is not likely to happen. But not likely to happen doesn’t mean it isn’t going to happen to somebody. So you need insurances, but you need to be able to hold the cost down. All these losses can profoundly affect a financial plan. You can just kiss retirement savings good bye if you get disabled. One of the things you do is to buy smart. You want to have a good cash reserve so that if you do suffer a loss, at least you’ve been adding to the cash reserve by what you save, and I mean big time, on the insurance, such as disability or what have you, by having an extensive or a long period in which the benefits not paid initially. That sort of elimination period, say on a disability policy, should be long, as long as they offer. If they’ll go longer than 90 days, such as 120 day, where they don’t pay, and your disability lasts beyond and then they begin. That’s the way to go, frankly. And you rely on that cash reserve before the other. Now that would be part of the tier three long-term cash reserve because those events are quite unlikely. But in a 10 year period or longer, they could easily hit you. And they’re devastating. Tier three, which might suffer a little bit of a loss, greater than tier two, will also get you a greater return most likely in most years. Then after that, you have the accumulation, which integrates more than anything else with your overall financial planning. It speaks mainly to goals and accumulation investment strategy for goals that are other than retirement, but some can do double duty. What cannot do double duty, and it’s a flaw out there in a lot of advice, is using annuities to fund. You lose a tax advantage, and so you really should not use a long-term device for a medium term strategy. Accumulation is mainly about medium term investment. Some people will use life insurance to do double duty, especially if the 401K doesn’t make sense for them, or if they have to save more than the 401K will allow, et cetera, et cetera. Also, tying in with just about everything because it can be quite a drag on your return, is your tax strategy. Tax management usually looks at the integration of different types of tax strategies, but the purpose of that is to diversify against the risk. The tax law will change at least to some degree, which means that you need … There are three basic categories. Some, like Roth for example, will not give you a tax advantage upfront. But you have tax deferral, and then you have tax free later. Others will be fully tax deductible on the upfront, such as a 401K or an IRA. But the money that comes out will be fully taxed, so you take the tax risk that you thought you were going to be in a lower tax bracket when you needed the money. But maybe tax rates went up, or maybe you had a higher income, or both. So you need to hedge against that too. Each of these has a slightly different tax characteristic, but they do fall into three categories and you have to balance that risk. And that’s really what that’s for. And then eventually we have to think about estate planning issues. That’s not just about dying, it’s about wise gifting, especially if … You mentioned earlier that nobody gets to 100% on their likelihood of running out of money. That’s true for nearly everybody. But there are many of the rich for whom it’s not so, that their probability of success goes way above 100%. In other words, you could take away a lot of their investments and still they’ll be at 100%, or nearly so, likelihood of not running out of money during their lives. Those people especially, I guess everybody should consider the stewardship that they owe to their fellow man. But if there is a true excess, they have a special obligation I think. They need to really ponder. But they need to do it efficient. And the Secrets of Successful Financial Planning goes into that about efficient methods of gifting both before and after death, and also, what happens when you are disabled, especially during retirement, so long-term care issues. Retirement planning is really all of those investment and tax issues all tied together, but focused on the income that you need for retirement. It has a sort of a sub category for everything, so there’s risk management within retirement planning, such as looking in detail at long-term care expenses and maybe how to save money by putting two people on one policy with a pool of money that is common to the two. You could draw from that pool, part being insurance, true insurance, and part being your own initial deposit to such an account. Long-term care insurance, I think, is most efficient when you have a really good long-term cash reserve plus a single pool of money for husband and wife for their long-term care because the odds are really against both needed long-term care. But the odds are that if you consider one of them, not necessarily a particular one, but one of the two will need long-term care. The odds are very, very high, upwards of 30% if you’re over 80. It really is that high, for at least a four year stay now, not just a stay, but a four year stay or longer. And many of these policies will pay over five years. Some will pay even longer. And the way they can do that is there’s more than just your own savings in there, or the interest on it. There’s true insurance there. And you can get several times your deposit. It’s a really good deal. It’s just like buying eggs or whatever in volume. If you make a big deposit, you can get probably the best deal for something like that. And the best ones will allow you to use it as income later, so it converts to an ordinary annuity. Let’s say you’ve lost a spouse. You can use the policy or plan to use the policy just for yourself. But now you’re in your mid 80s. You’re actually in pretty good shape. You went to see your doctor and he said, “Well, your probability of long-term care stay needs is certainly there, but it is quite low.” Your decision might be to use all or some of that money that was designated in a long-term care policy to now be converted over to an annuity for income for you or for giving, or to help your kids, or what have you, whatever may be needful. That’s really the best strategy there. And it explores different versions of that, and also some of the mistakes people make with both life insurance and with long-term care insurance, or really with anything. Then the end of life issues and also what happens to my affairs, whether I’m near the end of life or not, when I can’t do this, when I’m not competent physically or otherwise, to conduct my affairs. That’s all part of estate planning, the last portion. And I go into more detail than I’ve noticed most financial planners go in, in their books. Tim Mullooly: Right. All these different sections that you’re talking about, they all kind of weave together. You can’t really just focus on one or two different sections to get your way to success. Would you say that there’s one of these sections or different parts of a financial plan that gets overlooked more than another part? And if so, which section would you say? And why do you think that it gets overlooked? Dan Gallagher: Well, there are parts at least of every one that gets overlooked. Whatever’s the most unpleasant to do, or doesn’t give you the immediate satisfaction will tend to be like that. We’re human beings. We have to resist that. Some of insurance, for example, is really for someone else’s benefit. That would be life insurance. And I try not to be judgmental, but I try to coax people into realizing that if you take insurance, which is probably the most overlooked by people, and estate planning is probably the second most overlooked, it’s unpleasant. People look at especially life insurance, there’s really going to waste a lot of money. And there’s a common misconception out there because a lot of advertising back in the 70s and 80s that you should buy term and invest the difference. Well, it’s not quite that simple. For much of your insurance need, you should buy term and invest the difference. There are about five or six different needs that can be permanent, and one of them is for almost everybody, social security. Let’s say you’ve got spouses, both of whom will draw social security. But when one dies before the other, which is almost inevitable, the smaller of the two social security checks will go away. Well, that’s a loss of income, which if they’re going to get used to a particular budget, they need to replace, or else change their budget dramatically. When that happens, if you’re wise, you’ll have it replaced by means of life insurance. Social security goes on for one’s entire life, therefore the need to have that income replacement is also for one’s entire life. But it is typically not greater than you would’ve needed during the years when you’re trying to make sure you can replace income as well, that would go to put kids through school, save for a business, et cetera, et cetera, or even business life insurance that’s used to fulfill obligations and replace either a key person or compensate the company for loss of talent. There are long-term needs for life insurance, but are not permanent. There are permanent, meaning lifelong at least, that’s a better term because everybody will die. No such thing as permanent. I think people misunderstand it. They often go, “Dan, if I die such and such.” There is no if I die. Dan Gallagher: Anyway, financial planning, not just about accumulation and oh boy, I got a great rate of return, greater than my neighbor, or whatever. But rather, to realize and your goal really should be to steward that money efficiently. Money’s a tool. It’s no different than your physical tools. I have a son who likes to tinker with things just like I do, although I focus more on wood and he likes to work metal. We both have a pretty substantial tool set, but we use each other’s tools. I’m forever finding my tools on the grass, or dirty, or put back near where they belong, and not where they belong. And I just pull my hair out, and I don’t have a lot of hair left to pull out. But he does not steward. He drives me crazy. He does not. He’s improving, but he does not steward those tools well. Money’s just like that. We have a responsibility to other people, as well as to ourselves, to make sure that we can accomplish reasonable and dignified goals. That carries us through all seven topics. Obviously, there’s more to it than that. And I hope people will get the book. I don’t promote the book just to make a buck. You’d be surprised how little, how small the royalties are these days for relatively new authors. I want this book to go to people who care about other people. Tim Mullooly: And you talk about in the book, there are benefits to doing your financial plan yourself. And then there is also benefits to working with a financial planning professional. Can you talk maybe about what could be one benefit of doing it yourself? And then also, what’s one benefit of working with a financial planning professional? Dan Gallagher: Well, the obvious benefit of doing it yourself is that you’re going to save the cost. Not to be judgmental, but to be very frank, I’ve noticed that the more educated somebody is, even if it’s not in financial planning, the more they’re at least likely to assume that they can do it themselves, or that whatever they’re doing must be okay. If you’re really going to do it yourself, you need to invest $5000 or $6000, and by the way, that’s on the cheap, per year in a good program like NaviPlan. These are so expensive. And the ongoing subscription for the database update and so on, and the education to really understand what you’re putting in and what you’re getting out, and interpret it and operate the program correctly. That’s a very substantial investment, and I’m not sure it’s efficient to do that for just one person. Financial planning is something that should not be taken lightly, and certainly should not be skipped. But if you’re going to do it yourself, this really does give you the tools, including naming some of the software items and things like that, where you can do it right, and things to avoid. If you’re going to use a professional, The Secrets of Successful Financial Planning will tell you the right things to ask those professionals so that you understand and can gauge the level of deserved trust, and also understand the levels and distinctions between types of competencies. There are insurance professionals, for example, who just do that. But they’re thought of by people as being their financial planner. There are people who have incorporated everything from insurance to asset management to a number of other issues, so you need professionals to help you with this. It does talk about all the different types of professionals. My career was broader than most, I guess, because it included at least in the last seven or eight years, commercial real estate and business brokerage. It just gives people what they need to make the right decisions if they’re going to get a professional, and ask the right questions, and integrate the different types of investments that most professionals don’t really even view as investments. They view it as being maybe too risky. There’s a lot of real estate, let’s say, in somebody’s portfolio. And it’s actual real estate that they manage or whatever. Most financial planners would advise against that on both an asset allocation basis. It’s more than 20% now, you really are way too high. Not necessarily. It could be that their client really understands that business, which will reduce the risk level. If the planner understands these other items, or you include in your circle of advisors, usually best run by a certified financial planner, because they’re trained to understand and to coordinate all these other efforts from the legal, to the real estate, to insurance, to asset management. If you use financial planners as a team, as the old saying goes, you’ll have more heads being better than one and you come up a very, very competent team. Tim Mullooly: For you personally, we’ve talked a lot about the different lessons and values that readers can take away from the book. For you personally, what was the most rewarding part about writing this book and having it published? Dan Gallagher: Well, the rewarding part, I guess personally, was that it was the third thing that I actually had royalty published. And it was much larger than the other two because the other two were a coauthoring, and then just a contribution of one short story to an anthology. The financial planning piece, Secrets of Successful Financial Planning, was satisfying to sort of break into a larger project with a larger publisher. And this one specializes in expert advice, Skyhorse. It’s part of the Pegasus Group. That’s all they do. Sports experts, medical experts, legal experts, whatever the case may be, that’s what Skyhorse specializes in. That was personally satisfying. But really, I wanted to be able to give back to people who used it, control of their finances so that the angst that I’ve observed so much, of not really knowing for sure what to do, or what the best moves were, or whether to change from investment strategy, or advisor A over to B. And there’s a lot of angst surrounding that. That’ll keep people from even making a move that they ought, because they’re afraid of moving from the frying pan into the fire. It helps them understand where they are and where they could be. If there is to be an advantage in moving from A to B, they understand it well and will execute, and they can sleep better. And so that’s satisfying to know that if people use this, that’s where they’ll be. Tim Mullooly: That’s awesome. You said you incorporated real life stories. And it sounds like there’s really good tangible advice and tips in there that the readers can take away and apply to their everyday lives. Dan Gallagher: Yeah, they can. I was only a month and a half into my career back in 1987 when I encountered a lady working for Met Life. This lady had been served by another representative who was not there any longer. But that representative did all the right things for her and for her husband. Here’s what happened though. It was a tragic result despite all that. We talked about how social security can be replaced by life insurance. You can do that with the survivorship on a pension as well because many people don’t know until the last year when the law requires it be disclosed, that the survivor benefit, continuation of pension to a widow, it’s not free. It’s not automatic. It is a legal right since 1986, actually 1987. A spouse of a retiree who has a pension does have a legal right to continuation of the pension. Most people’s understanding of that stops there. And when it stops there, they assume that it’s just going to continue, and in the same amount too. And that’s not so. To pay over the longer of two life spans, a pension plan has greater costs. But there’s a conflict of interest here, even though these trustees are supposed to work for the participants. The way they view it though, it’s the whole group of participants, not any individual. And that’s where the conflict comes in. If a person were to look at the survivor benefit that they have on their pension, and realize that is a life insurance policy too. It’s a payment contingent upon death that they do have to pay for, which is a premium, by reducing the pension. And sometimes that’s quite substantial. And they should compare that to a life insurance policy. But there’s many more things to know. But the basic fact is that when they do that comparison, they’ll examine whether the company demands that they participate in that survivor benefit payment at least to a small degree. But why would such a rule be implemented anyway? And why would it be such a, not necessarily secret, but held back from people who don’t inquire until the last year of before retirement? And that’s this. If people who are in good health can get valuable policies, especially these days when policies are much cheaper than they used to be, which is not necessarily the premium. When they make that comparison to the survivor benefit that requires a reduction in pension to get it, they often will find that especially with low load policies, or policies that have a smaller ongoing load, that it’s cheaper to get the life insurance. Now there are a lot of planners out there have said, “No. No. It’s not because you’re likely to die at 75,” and yada yada. If you do those calculations that way, it’s going to be a challenge for the life insurance to beat the survivor benefit. The reality is that people live longer than that. And so some of those assumptions are wrong for those who disapprove of replacing a survivor benefit with life insurance. And if you do it right, it’s typically for somebody who’s at least standard non smoker and typically above standard and definitely non smoker. But imagine from the perspective of the pension plan that this happens a lot. If that does occur a lot, then what’s going to happen is you have adverse selection. You have the people who are in good health coming out of the survivor benefit pool, but no longer making the reductions in pension during their lifespan. Instead, the pension plan is left with people who would probably die young, and that reduction in their pension stops. And the pension plan now has to pay for what is usually a long period of time for the surviving widow or widower. It is definitely in the financial interest of the pension plan to not tell people about this until the last minute. And in some case, to sort of begrudgingly give the into. Well, this lady and her husband got such a policy, but guess what. The agent advised against it, but the husband prevented that information from getting to her. The husband was the owner of the policy. The owner of the policy is the person who can terminate the policy, only the owner. A few months after they got the policy for this purpose, the husband terminated the policy, even though he was required in the property settlement to continue the policy. She didn’t know about it because she wasn’t going to get any of that mail. And so when he died very shortly after terminating the policy, two and a half months I think, just long enough to get beyond the grace period, it was really … And it was a big policy too. And her payment for her mortgage depended on that income. Now for her, the pension stops and the policy does not pay, and she’s ruined. She couldn’t go back on the insurance company because everything had been done right. They had certified letters to the both of them, but the husband screened the mail, that informed them that she should be the owner, not him. If she’s going to give up a legal right to a survivor benefit, she should gain in return a legal right to operate the policy. Most people when they do this, do this wrong for some technical reason. And because there’s a lot of opportunity to do it wrong, there’s a lot of fear of liability by insurance companies and financial planning firms. And guess what, you won’t even find calculations for this in NaviPlan and the popular financial planning programs. You’ll probably find quite a few CPAs and regular financial planners who are not aware of this at all, or they take the old advice, when the policies were much more expensive and they say, “This is not a good idea anyway.” And then of course, because of the liability involved, some of the carriers and some of the firms will actually forbid explicitly in writing in policies, corporate policies, forbid their planners from discussing or doing the calculations and replacing survivor benefits for their clients for this purpose. That is wrong and bad for the public. It’s bad for the public to learn about this a year before retiring, and so on. There’s a lot of real secrets in financial planning. Another example, regulators will not permit advisors or agents from telling people that there is effectively something almost as good, similar to the FDIC that banks have to cover life insurance companies that go bust. Every state has a state guarantee corporation of some sort that handles this. And they get a lot of money for this. People don’t know that they pay 2% in premium tax on annuities and life insurance for this purpose. That’s what funds them. The past, I guess about 30 years ago, the last big one to go bust was in New Jersey. People did not get more than about 80 cents on the dollar for the benefits. And there’s a limit anyway. But there’s also a limit for FDIC insurance. Is FDIC insurance kept a secret from the public just because the FDIC does not want people to know, or banks to know, and et cetera, that somehow they could take advantage of the FDIC insurance? Well, what insurance regulators are afraid of is that this will be given as a reason to relax about the fact that a company or carrier might not be as financially sound as the next. And so they use that as a justification for forbidding people from knowing about that. And they can’t control people, but they can control the agents. People will still want to know because there’s still risk, even with the state guarantee corporations, that it could pay less than they expect, or even that it would go bust. It’s not quite as good as the FDIC insurance, but it’s darn close. And people have a right to know about it. And if they see a very good deal with a B plus company, there’s reason to relax about that. If they go to a C company, or a B minus company, that’s bad in and of itself. But it’s all independent of whether or not they should learn about the insurance for insurance companies. Tim Mullooly: Yeah. I totally agree. You need to shed light on some of these things so that people at least have the ability to make those decisions for themselves. They need all of the information, so I think that’s really great that this book kind of sheds light on some of these secrets that people should know about, and don’t. Dan Gallagher: Yeah. Unfortunately, what happens in the market is there’s the other kind of abuse, where the agent says, “Oh, my competitor recommended a carrier that’s an A company, or they’re just an A plus. But my carrier’s an A plus plus. Therefore, you should use that company.” Well, the difference between the two is frankly minuscule when it comes to being confident that they’ll pay a claim, especially when you consider that there is an FDIC like carrier of sorts in every state for insurance carriers. The reputation, it doesn’t have the federal taxation ability to refund if it runs out of money and so on, so it’s almost as good as the FDIC, not quite. But people deserve to know it, and agents deserve to be able to reassure people. And to counter the argument, which is bogus, that my carrier is an A plus plus. My competitor’s carrier is an A, and therefore he’s giving you a bad deal. That sort of thing does happen. Tim Mullooly: Yeah. I mean, hopefully the readers of this book will be able to pick up on some of these things that we’ve been talking about. That was all the questions that I had for you today, Dan. It was really great to take a peek inside the book and give the listeners here kind of an intro into what they can hope to expect. Thank you very much for coming on the podcast. I really appreciate you taking the time. Dan Gallagher: You’re very kind. I hope folks will go over to authordan.com because there’s more than just this financial piece there. There’s some fun things for free. Tim Mullooly: Awesome. Yeah. We will link to that in the show notes as well for anyone listening. You can find the book. You can find all of the other works by Dan as well that he’s talked about. The book, Secrets of Successful Financial Planning, is out September 25th, so that comes out next week. For anyone listening, if you want to know more about what we talked about here today, be sure to go pick up a copy. And thanks for listening to this episode of Living With Money, and we’ll see you on the next one.